I love my kids unconditionally. It's not hard. According to the National Center for Transgender Equality, 41% of trans youth report that they have attempted suicide at least once. Not because being transgender is a mental illness that causes one to be suicidal (it’s not), but because of the systemic discrimination, hateful rhetoric, and lack of support that so many transgender people experience every day. Kids are especially vulnerable when it comes to bullying — whether it’s coming from the pulpit, the President, or the playground, these types of experiences weigh heavily on a child, and forms their understanding of their value in the world. I’m the mother of a 9 year old transgender kiddo named Max, and I’m often asked by friends and strangers alike what they can do to be better allies and to support him in a world that at times seems like it wants to erase him instead. 1. Use the correct pronouns. I want my son to know that I love him unconditionally, and using female pronouns when he isn’t a girl is a surefire way of diminishing his self-esteem and making him doubt my support of him. So when I would accidentally misgender him, I’d stop. I’d apologize. I’d correct myself. And then I’d continue on with the conversation. No need to make it awkward, but definitely a need to acknowledge ways I could do better. Over time, it became normal and natural to use male pronouns. Looking at him, you’d agree. But it took me, his own mother, several attempts before I finally got the hang of it. It might take you a little longer, too, but practice makes perfect. So don’t give up. 2. Always use the correct pronouns. This one was hard for me too. It took me a long time to understand that Max has ALWAYS been a boy, even when he was a wee thing and was too young to talk and express it himself. I struggled for a long time trying to tell stories of him when he was a baby, and trying to figure out if I should say “she” (because that’s the memory I have), or “he” (because that’s who he’s always been). The general consensus in the transgender community feels that it’s important to be consistent in our use of pronouns and names. Not doing so only reinforces a falsehood that a person can be a girl one day and a boy the next, when in fact, gender identity is something you’re born with, not something you choose. To put it another way: Max has ALWAYS been my son, so it’s important that I talk about him both pre- and post-transition in language that validates this simple fact. Just because I dressed him in pigtails and polkadots as a baby doesn’t mean I had a daughter. Instead, I had a son who was too young to tell me that he was a boy. And my language and his pronouns should reflect that. 3. Don’t “out” transgender kids or families, even with good intentions. I know you mean well. 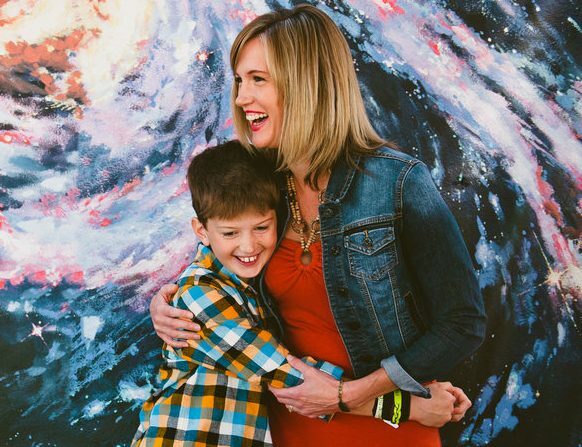 I know you want to form a connection with my family and show me what a supportive person you are (and who can blame you — my kids are pretty amazeballs and I’m sure you and I would be great friends!). But when you tell me that you know another LGBTQ kid, and share with me identifying information about them, you just outed that child. Maybe that family isn’t as public as mine. Maybe they’re still stealth. Maybe that’s an invasion of their privacy and you just did more harm than good. I LOVE knowing that you know other LGBTQ kids — because you know what? They’re everywhere. It shows that you’re paying attention to the world around you, and not discriminating about who you allow yourself and your children to be friends with. That’s awesome! And you can totally tell me these things in generalities if you want to talk about it. But next time, ask the other people involved if it’s okay for you to mention that they’re LGBTQ. Don’t out kids or families, even with the best of intentions. 4. Make sure you’re inviting them to things! Did you know that it’s still legal to fire a person from their job or evict them from their apartment simply for being transgender? Did you know that there are transgender students today who are forced to use the nurse’s restroom, even though the Supreme Court ruled in Brown v Board of Education that separate is never equal? Did you know that the 2017 Texas state girls’ wrestling champion was actually a boy? Mack Beggs is transgender and his birth certificate listed him as female — so guess which team he was forced to join? The girls’ team — despite receiving medically prescribed testosterone from his doctors and the fact that even the International Olympic Committee understands that what’s between your ears is more important than what’s between your legs. There’s a lot of socializing that happens in school bathrooms and on sports teams. And when trans kids are left out of those social spaces, it’s easy for them to feel forgotten — and easy for their friends to forget them, even when they don’t mean to. That’s why invitations to special events — a birthday party, a bonfire, a playdate, and yes, even a sleepover, are so important to trans kids. Make sure you’re including them. Because when the whole world is telling them they’re different, you have a chance instead to tell them that they’re special. I bet your kids are amazing, just like you are. I bet you’re teaching your kids to react from a space of love and compassion, and not a space of fear and misunderstanding. That’s awesome, and I’m so proud of you for raising such great allies! But sometimes things don’t come obvious to kids (like how to find that other shoe that’s literally laying right in front of them). That’s why I’m asking you to help. When my son Max went back to school with a new name and new pronouns, he didn’t lose any friends. They all loved him just the same as the day before (and parents like you are to thank for that!). But the constant questions of “Are you a girl or a boy?” and “Is your name Max or ____?” can really make recess feel like more work than play. This doesn’t exactly fit the definition of bullying — it was just kids asking curious questions. But over time, it started to wear on my sweet boy. So I asked the parents of his friends if they could instruct their children on what to do in that situation: specifically, tell the other kids that Max is a boy, and then ask them if they wanted to play. That answered their questions, didn’t single anyone out, and showed Max that they’ve got his back no matter what. Eventually, the questions stopped — and more importantly, his circle of friends (and allies!) grew. I’d rather change the world than change my son. Max is a creative, lighthearted, musically gifted, athletic, sweet, helpful, snuggly kiddo, and there’s nothing about him that needs to change (except maybe his attitude when I ask him to take out the trash.) Unfortunately, though, he’s facing a world that doesn’t understand what it means to be transgender — and worse, wants to discriminate against him because of it. If you made it to the end of this essay and shared it with a friend, though, then you’re already a couple of steps ahead of most people when it comes to being an ally. This certainly isn’t a complete list, and change isn’t going to happen overnight — but combine these ideas with the actions you’re already taking, and eventually we can change the world, and make room for Max (and the countless gender colorful kids like him) to live their authentic, awesome lives.